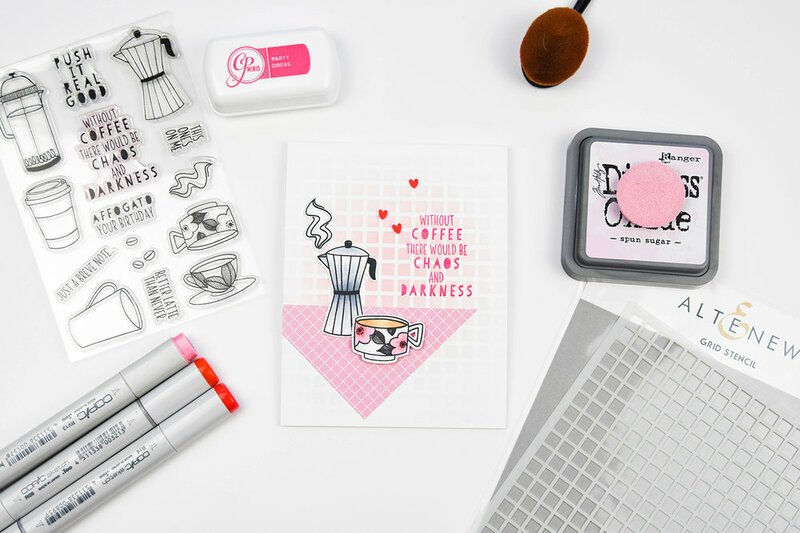 The Ellen Hutson release for February is one of my favorites because … um, coffee. *laugh* The Breve Note set is near and dear to me because I have an Italian espresso maker at home that I use daily. When I saw it as part of this release I was super excited! For today’s card I wanted to create a table scene. I used some Neenah Solar White 80 lb cardstock as the base for this card. Using the Altenew Grid Stencil I created a wallpaper look using a Life Changing blender brush. These brushes are so great for adding color in varying levels of intensity to your background. I cut a 3”x3” piece of some MFT Graphic Grid paper (MFT Tiny Check paper would also be a cute option). I cut the 3”x3” square corner to corner to create a triangle for the tablecloth. I adhered it off-center to the card front. Using my Mini Misti I stamped a sentiment in Catherine Pooler ink, Party Dress. I aligned the sentiment with the edge of the tablecloth. 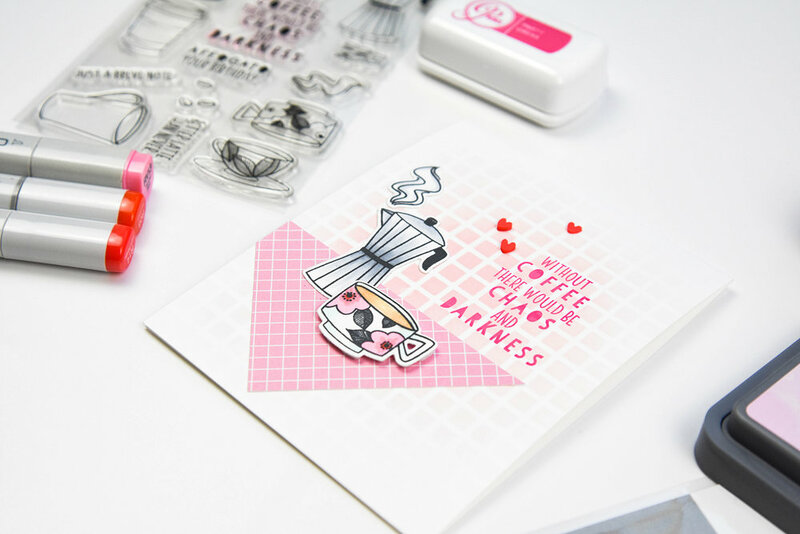 Next I stamped the espresso maker, the steam image and one of the coffee cups using my Copic friendly ink, Memento in Tuxedo Black. I colored them and adhered them to the front of the card. Thanks for stopping by today. I hope you’re having a great weekend. We are snowed in here in the PNW and I am loving every minute of it!